Electrical power systems’ evolution toward a smart grid is spurring the growth of network automation on all voltage levels. The IEC 61850 standard is quickly emerging as the choice for designing power utility automation systems. As such, the scope of the standard has widened from pure substations to all automation aspects of the domains of power generation, transmission, and distribution, including distributed generation. All other legacy protocols also allow protection, control, and measurement functions. IEC 61850’s value is not limited to communication mapping. It includes support to accommodate business-related semantic models, which allows power system equipment modeling, associated smart functions, and related global information exchange, as well as sufficient flexibility for undertaking new demands as shown by the recent shift toward the smart grid. The standard’s evolution requires the transformation of engineering tools to meet new challenges with a focus on two issues: interoperability and performance estimation. Interoperability, the idea that intelligent electronic devices (IEDs) from different manufacturers can exchange information and work together in a system, is an important aspect of IED and system engineering and a central goal of IEC 61850. Interoperability is a key consideration in order to enable the proper performance of a given automation solution in a multi-vendor system. Further, the subject of performance estimation is important because it provides early insights into the feasibility of the performance of a given solution and thus reduces risk — technical and contractual — in a multi-vendor environment. Data analytics play a large role by helping users discover meaningful patterns in data and by transforming data into insight for better decision making. By creating, incorporating, and enforcing a rule-driven system specification for analytics, system integrators can, for example, design rules for a specific project context for later use during the project design phase. Essentially, these rules will teach software to automatically respond to particular situations, controlling risk and increasing efficiency. The primary role of rule-based analytics in an IEC 61850 setting is to detect non-interoperability between IEDs and to estimate system design performance. Analytics can reduce non-interoperability risks by emphasizing the specification of a given system function, which will improve early detection of non-interoperable behavior and allow for correction. Performance estimation analytics enable the creation of performance profiles of the multitude of IEDs That provides visibility over a product’s life cycle and applicability of a given group of product to design a given automation solution. Forward-looking utilities, industrial grid operators, and system integrators should investigate how they can leverage engineering tools and analytics to reap these benefits. 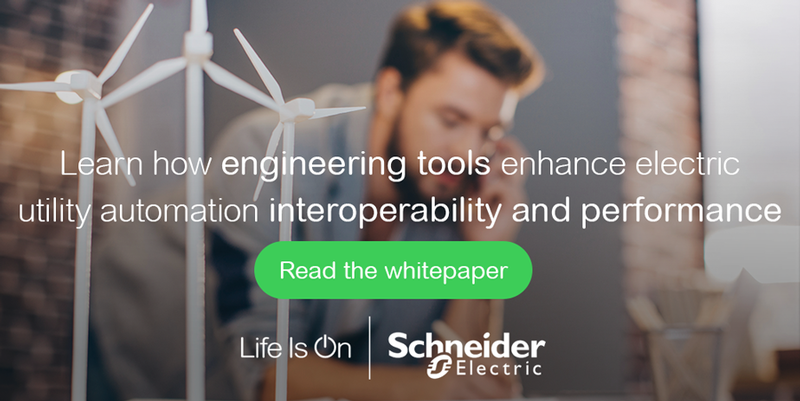 Read this white paper for an in-depth look at the role interoperability and performance estimation play in IEC 61850 and to learn more about analytics and the cloud. what specific software offers SE? In the domain of Substation Automation and Protection Schneider Electric is offering the related tools to enable configuration and test of protection relays and bay computers (IEDs), gateways and HMIs as well as the tools for system integration according to IEC 61850. The system engineering tools are supporting Schneider Electric own product ranges as well as 3rd party IEDs. Further Information could be obtained from Schneider Electric website looking for “Substation Automation” or “Easergy Studio” as an example. Would you be willing to change your software in order to facilitate this joint work or what would be the most appropriate solution for you? Dear Luis, thanks for your comment. Let me tell you that Schneider Electric is continously contributing strongly to the development of the standard IEC 61850. Innovations and evolutions in IEC 61850 are taken into account into the roadmaps of our offer evolution beside functional enhancements. These innovations and evolutions are valid for the engineering tools as well as for the intelligent electronic devices like protection relays on a regular manner.